The Heroic Men and Ships of World War II’s Most Decorated Navy Destroyer Squadron. This book tells the story of the first of the new Fletcher-class destroyers that joined the Pacific fleet in fall of 1942. They held the line against the Japanese fleet until America’s shipyards produced the new ships that would eventually defeat the Japanese Navy. These first three ships would later be formed into Destroyer Squadron 21 (Desron 21), which became the battle hardened US Naval squadron of World War II. The USS O’Bannon (DD 450), the USS Nicholas (DD 449), and the USS Fletcher (DD 445) arrived in the Pacific theater in September 1942 and were immediately put to work escorting ships, patrolling against enemy submarines, bombarding enemy positions on Guadalcanal, and shooting down enemy planes. There was a severe shortage of destroyers and they were in constant demand and were working and fighting almost nonstop. Other new destroyers arrived in 1943 and were also put to work immediately. Over time, some were sunk, others were damaged, but they were constantly in service. When Admiral William Halsey selected Destroyer Squadron 21 (Desron 21) to lead his victorious ships into Tokyo Bay to accept the Japanese surrender, he chose the most battle-hardened US naval squadron of the war. But it was not the squadron of ships that had accumulated such an inspiring résumé; it was the people serving aboard them who won the battles. This is the story of Desron 21’s heroic sailors whose battle history is the stuff of legend. 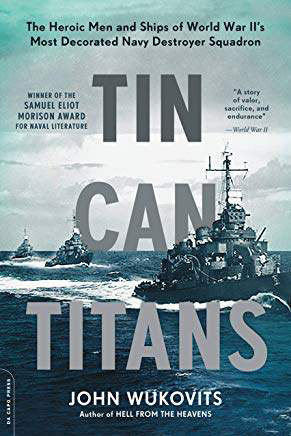 Through diaries, personal interviews with survivors, and letters written to and by the crew during the war, John Wukovits brings to life the human story of the squadron and its men who bested the Japanese in the Pacific and helped take the war to Tokyo. – King County Library Review.